On a warm summer day, with the cool breeze rustling my hair and a sense of fascination in my eyes, I cycled under a canopy of trees along the River Maine, crossing skaters, runners and stand-up paddle boarders. The cycling track gradually led us through Frankfurt’s old town, past hip skateboarding parks and fancy new skyscrapers, to giant sequoia trees and charming old bridges. Before I landed in Frankfurt for the first time in 2013, I expected to yawn myself to sleep in this well-known financial hub. But five short trips later, I’ve discovered that Frankfurt is like a hipster wearing a business suit. 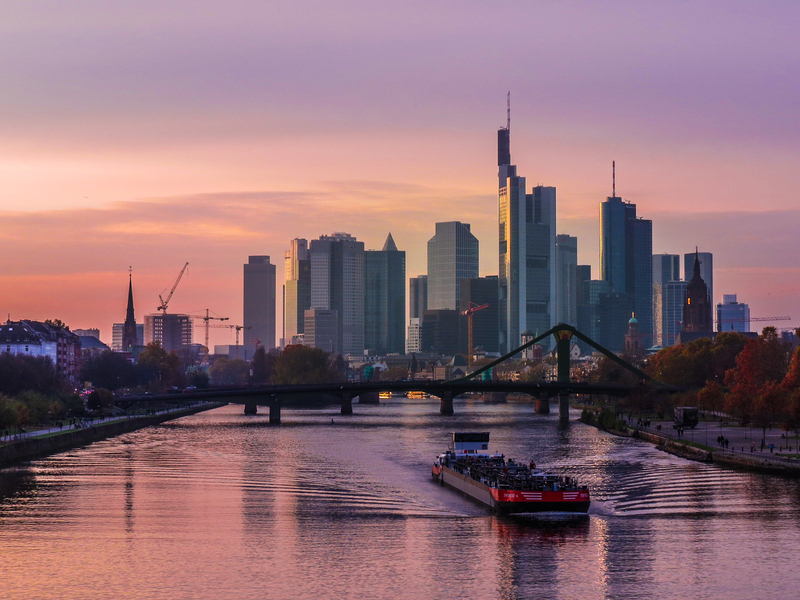 Take my list of fun and offbeat things to do, and let Frankfurt show you its cooler side too! Exploring Frankfurt differently. Photo via Velotaxi Frankfurt. It is one thing to ride a bicycle or get somewhere by taxi, but quite another to get on an electric bicycle that has been refitted like a trishaw (cycle rickshaw) – aka a Velotaxi! A testimony to both, Frankfurt’s growing alternative scene and its commitment to being eco-friendly, Velotaxis whizz along the streets of Old Town, fast enough to get around efficiently, yet with enough time to embrace that modern and medeival architectural contrast that makes the city so unique. I took a short ride on one, and the driver, who happened to be a globetrotter on a break, shared some fascinating stories of how these streets have changed since his childhood! You can hail a Velotaxi off the street, call one in advance, or even book a short city tour on the Velotaxi website. Villa Kennedy all lit up! Photo via Villa Kennedy. An unexpected way I could (dreamily) relate to the ‘financial hub’ status of Frankfurt, is staying in the charming Villa Kennedy, once the home of the Speyers, one of the city’s most influential banking families. The old part of the villa is a glimpse into their lavish, artsy lifestyle; they loved music and often held concerts at home! I love that the now boutique hotel retains the traditional charm and architecture; my room overlooked a sunny courtyard where live music from a private event gave me a glimpse of what the Speyer family concerts in the days of yore must’ve felt like. Apple wine murals in Sachsenhausen. Photo by Minoru Uchida. It wasn’t until my #NotJustBeer trip to Germany that I learnt that Frankfurt is Germany’s original hub of apple wine. One legend suggests that the city folk tried hard to grow Riesling grapes like the rest of the Hessen region, but they always caught some fungus, resulting in a bad harvest. Disappointed, many took to fermenting home-grown apples to make apple wine, instead of buying Riesling from their neighbours. Across the River Maine in Sachsenhausen, Zur Buchscheer is a family-run wine house that has been serving homemade apple wine since 1876! See a list of other apple wine taverns in Frankfurt here. If you find the wine too strong, try “Apfelwein mit wasser”, diluted with water. Fireworks in Frankfurt! Photo by Peter Samow. Coming from India, my notion of a festival is very, very different from Germany. In Frankfurt, I’ve joined local friends to celebrate everything from apple wine (Apple Wine Festival) to museums (Museum Embankment Festival) to the red light district (Bahnofsviertel) to traditional Christmas Markets. I love the way people from all walks of life take to the streets to drink wine/beer and make merry all night long – a glimpse into the cultural diversity and quirky soul of Frankfurt. And the fireworks… I’ll let the picture do the talking. If you ask me, the only way to feel intimate with a big city is to discover its by-lanes on a bicycle. But as a short-term visitor, renting a bike without signing up for a tour or paying a big deposit isn’t always easy. Trust Germany to have it figured out – Call a Bike is an app that allows you find bikes for rent near you, drop them off anywhere you like in the city, and pay (1 euro for half hour) through the app. My favorite cycling route is along the River Maine, and I would someday like to ride the 75km green corridor on the outskirts of Frankfurt. Pretzels, dips and Riesling. What’s not to love? I’ve met so many people in the last year of traveling as a vegan, who want to experiment with veganism too but just don’t know where to begin. I think a vegan-friendly city like Frankfurt is a great start. You can go armed with the Happy Cow app, which maps out vegan-friendly eateries near your location, or just keep an eye out for places that advertise a vegan option; I’ve had some delicious vegan burgers, organic plates and Middle Eastern food in Frankfurt out of pure serendipity. Despite the meat-dominated local cuisine, many of my German friends have adopted a plant-based diet, so Frankfurt is a great place to bond with fellow vegans too. View of Frankfurt from the 56th floor of Main Tower. Not exactly offbeat, but I love the rooftop of the Main Tower, 56 floors high, for a panoramic 360 degree view over Frankfurt; two trips up there made me appreciate how green this city is, and how much of its traditional architecture has been restored. You can buy a ticket for the observation deck of Main Tower online; it costs 6.50 Euros per person. A light-hearted moment with Ms Maurer. I’ve discovered something unexpected on each trip to Frankfurt, and this time, it was meeting Monika Maurer, Frankfurt’s only traditional potter who uses her wheel and kiln to create and burn bembels – traditional vessels used to serve apple wine! She is affectionately called “bembelina”, and in a single evening, I saw several locals drop by the store to buy bembels and apple wine cups, with names and messages painted on them – definitely Frankfurt’s most popular souvenir. Toepferei Maurer, the family-run pottery workshop and store is located on Wall Street in Sachsenhausen. What would you add? And what’s on your Frankfurt wishlist? I wrote this post as part of the #DiscoverHessen campaign with Hessen Tourism. Some of my experiences in the city were hosted, while I paid for the others myself. I only recommend what I really love. Join The Shooting Star on Facebook, Twitter and Instagram for more quirky ways to discover popular destinations around the world. Thanks Madhavi! Loved the vibe of Berlin too. So much more to discover in Germany, even for me! Great website/blog! — if you’re curious I happened upon it while trying to learn about the Sangla region in India — and your photos/blog were high up on the search results. Alas I’ve never been to Frankfurt outside of the airport (which is kind of a terrible airport lol). Haha, they’ve recently revamped part of it and it looks pretty swanky. But I’m always at a loss trying to find any vegan food (other than potatoes) there! 3. not mind throngs of people. I attended the fair for the first time this fall and was enthralled. That sounds awesome. I usually hate crowds, but I guess I’d bear them for a book fair though! Question – it is mostly books in German? My Aunt recommended to me your blog, can’t wait to read your posts! Just started my own travel blog… hope you can check it out! The first pic on the image is surreal. Apple Wine does sound interesting ! I have been planning to make it to Frankfurt and since I always make sure to put a smart plan before I embark for any journey. However, your list along with the useful travel tips are enlightening. Many thanks for sharing and I look forward to reading more of your interesting stamped experiences! The serpendity of Vegan and meat eating is fascinating. Frankfurt has been in my list forever now, your post makes me want to pack bags and leave right now. Previous PostLake Atitlan, Guatemala: The Feeling That I’ve Found My Place on Earth. Next PostMy Most Memorable Sunrises, Sunsets and Night Skies of 2016.